Louise Reddan shares her babywearing journey with us. My sister-in-law had talked about stretchy wraps to me during her pregnancy, and I could see that one might be useful when my niece was born. When it was time for my baby shower, I asked for one as a gift. I think it was one of the best pieces of baby gear I’ve owned! I did a lot of reading about how babywearing is beneficial to both mum and baby. Other parents’ experiences of using a wrap or carrier to settle their baby to sleep seemed really positive, and I could see that babywearing could help babies to sleep too. Once Oscar had arrived, I used my baby sling at home and when we went out. It was so helpful when he needed cuddles but I still needed to get a few things done. I was grateful that Oscar was a fairly settled baby and not too fussy when he was smaller. On those occasions that he was unsettled, it was a lifesaver to have the stretchy wrap to hand. I could keep my baby close, and settle him while I did bits and pieces around the house. We have a dog, and babywearing made walks out and about with our do so much easier too! 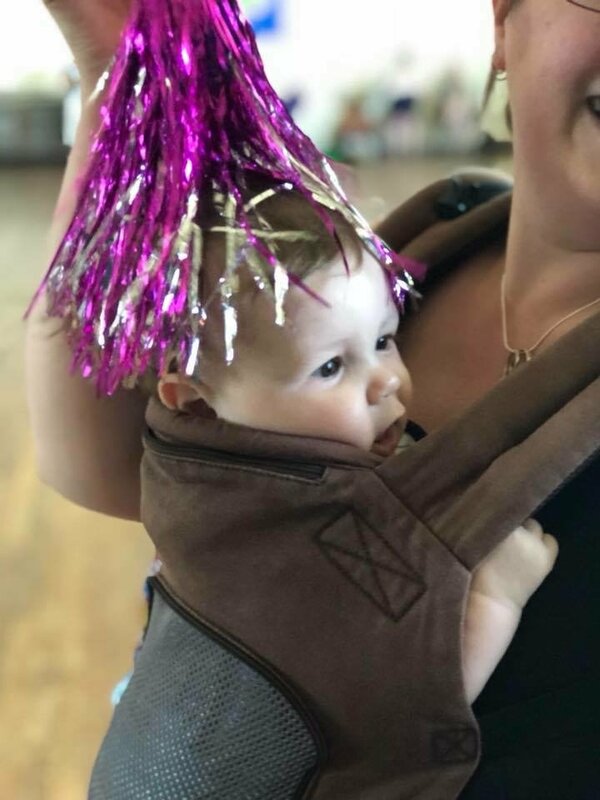 I joined a Sling Swing class and met other mums who were big babywearing fans. Through them, I found out about our local sling library! I’ve so far rented two slings from the sling library, and had some excellent advice about using baby carriers safely and comfortably. I love going to Sling Swing classes. I’ve been going for almost a year. I can see that Oscar enjoys the dancing and music too – he smiles and laughs throughout the class! My Sling Swing teacher is fabulous at organising extra events and classes. I’ve participated in a Valentine’s Flash Mob, as well as a Christmas one. Knowing that Oscar is safe and secure in my baby carrier is really important for me. I’ve found it so much easier to get out and about with a carrier, and it’s made events and places much more accessible for both me and my baby. I think my bond with Oscar is stronger through babywearing. Carrying him has definitely had a positive impact on my mental health. Knowing that I can easily go places and meet with other mums has just made motherhood less stressful. I’ve met some amazing mums through babywearing too, at Sling Swing classes and at our local sling library. Oscar’s now mobile. He loves to clamber all over me. The transition to motherhood has been difficult for me at times, but knowing that I have this brilliant parenting tool to help settle him has always helped me to stay calm! When baby number 2 is here, I want to continue my babywearing journey for as long as possible.